How to Track Which Garment is Made by Which Women? Question: I have started a small clothing startup to empower slum women, where we teach slum women how to make clothes then I give them employment or job-work at my center. I have 6 basic paddle foot machines and two electric sewing machines. Can anyone please guide me how to track that which garment is made by which women so that we can tell her to rectify the mistakes which she is doing? I have picked this question from OCS forum (which is closed now). I am answering this question after a long time after receiving this question. Tracking of a worker who made which garment is a valid requirement for many reasons. You have mentioned one reason that you need to find the woman who made mistakes in a particular garment. If you can track that, you can give back the defective garment for repair work or tell her to rectify the defect. This information can be other ways too. Like, identifying women who need more training and skill development. You can also track who made how many garments and calculate their earning accurately. Here is one solution for your requirement. Use the tag/label made of vinyl tapes (material that is used for wash care label printing). You can pre-print a format in the tag and write requirement information on the tag using ball pen. See following images for example. You can utilize both sides of the tag. You can use your own label format/layout for tracking necessary information. 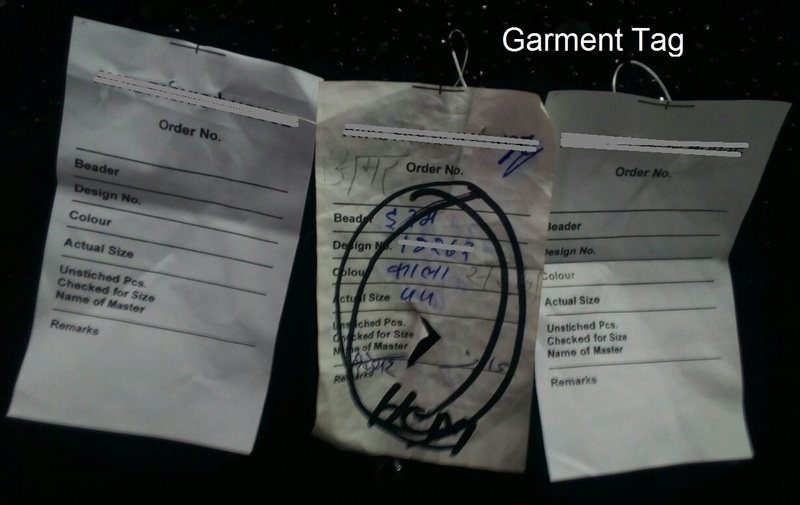 The garment tags shared here is used by a fashion house. I have seen this factory making high fashion garments. They also send garments to outside for hand work. Later the garment is given to a tailor for stitching. Further, the garment is given to hand repairing team for correction of beading and finishing the garment. The garment is thoroughly checked for all processes. They also track who checked the garment at various stages. One garment from fabric panel stage to completed form moves through different hands. Factory tracks who all processes the garment by using this tag. They write the name of a worker on the tag with the serial number of the garment. You can follow same method for tracking the women who made any specific garment. 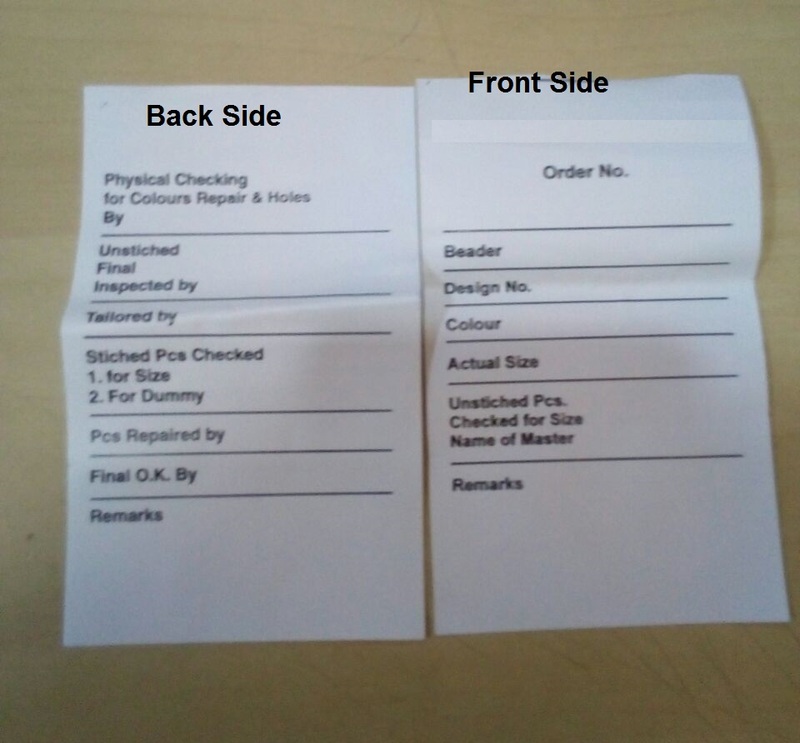 For printing this type of garment tag (label) you can contact label printer. 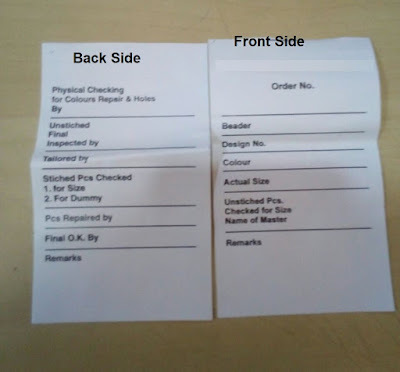 You need to provide them you label size and layout of information you need to print on your labels. You can also use Barcode or RFID technology for tracking garments and women who made which garments. As OCS forum is closed now, you can directly write me using our contact form, if you have any question. Online Clothing Study: How to Track Which Garment is Made by Which Women? High fashions clothes are still made of a lot of hand work. Each garment is made by women and male workers at their home or small workshops. How do you track those garments and person who made which garment? Read this post and find the answer.